Definition at line 296 of file lllineeditor.h. Definition at line 2345 of file lllineeditor.cpp. 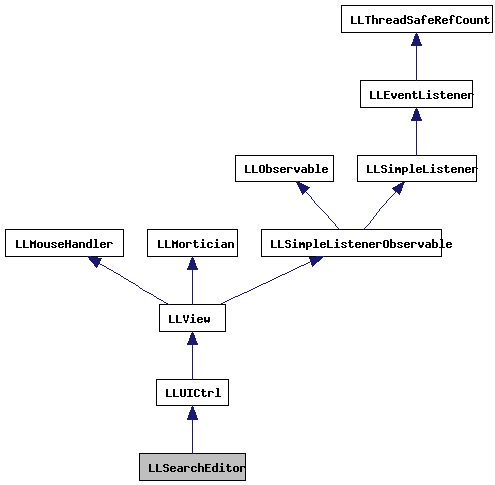 References LLView::addChild(), FALSE, LLRectBase< Type >::getHeight(), LLRectBase< Type >::getWidth(), mClearSearchButton, LLView::mRect, mSearchEdit, NULL, LLStringBase< char >::null, onClearSearch(), onSearchEdit(), S32, LLUI::sColorsGroup, and TRUE. Definition at line 2390 of file lllineeditor.cpp. Definition at line 2431 of file lllineeditor.cpp. Definition at line 2440 of file lllineeditor.cpp. 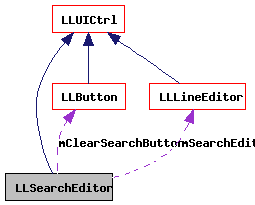 References LLView::draw(), LLLineEditor::getWText(), mClearSearchButton, mSearchEdit, and LLView::setVisible(). Definition at line 2475 of file lllineeditor.cpp. References LLView::createRect(), LLUICtrl::initFromXML(), LLSearchEditor(), mSearchEdit, NULL, S32, LLLineEditor::setLabel(), and setText(). Definition at line 2413 of file lllineeditor.cpp. Definition at line 2401 of file lllineeditor.cpp. Definition at line 2395 of file lllineeditor.cpp. Definition at line 2463 of file lllineeditor.cpp. References LLUICtrl::mCallbackUserData, mSearchCallback, LLStringBase< char >::null, and setText(). Definition at line 2453 of file lllineeditor.cpp. References LLLineEditor::getText(), LLUICtrl::mCallbackUserData, and mSearchCallback. Definition at line 2425 of file lllineeditor.cpp. Definition at line 317 of file lllineeditor.h. Referenced by LLInventoryView::init(), LLFloaterLandmark::LLFloaterLandmark(), and LLFloaterTexturePicker::LLFloaterTexturePicker(). Definition at line 2447 of file lllineeditor.cpp. Referenced by LLFloaterTexturePicker::draw(), LLInventoryView::draw(), fromXML(), and onClearSearch(). Definition at line 2419 of file lllineeditor.cpp. Definition at line 2407 of file lllineeditor.cpp. Definition at line 298 of file lllineeditor.h. Definition at line 329 of file lllineeditor.h. Referenced by draw(), and LLSearchEditor(). Referenced by onClearSearch(), onSearchEdit(), and setSearchCallback(). Definition at line 328 of file lllineeditor.h. Referenced by clear(), draw(), fromXML(), getValue(), LLSearchEditor(), setLabelArg(), setText(), setTextArg(), and setValue().